A recently published report by the Correctional Association of New York, Reproductive Injustice, addresses the reproductive health care for women in New York State prisons. The Report was commented on here by Pace Prof. Michael Mushlin and has sparked debates across the state. Please join PILSO (Public Interest Law Student Organization at Pace)and the CJS (Criminal Justice Society at Pace) on Wednesday, April 1, 2015 at 12:30 pm – 1:30 pm in Tudor Room of Preston Hall at Pace Law School for a panel discussion on the rights of women in NYS prisons. Lissa Griffin, Professor of Law at Pace Law School, Director of the Pace Criminal Justice Institute, and an expert in wrongful convictions and criminal and comparative criminal procedure. Join us for a thought-provoking discussion and learn how to get involved. Refreshments will be served! 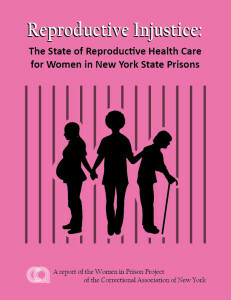 Tamar Kraft-Stolar, Reproductive Injustice: The State of Reproductive Health Care for Women in New York State Prisons, Women in Prison Project of the Correctional Association of New York (2015) (full PDF) (executive summary). Handbook on Women and Imprisonment, UNODC Criminal Justice Handbook Series (2d ed. 2014). Rachel Roth, She Doesn’t Deserve to be Treated Like This: Prisons as Sites of Reproductive Injustice, Reproductive Law for the 21st Century Papers – Center for Women Policy Studies (July 2012). Reproductive Health Locked Up: An Examination of Pennsylvania Jail Policies, ACLU Pennsylvania (Jan. 2012). Women’s Health in Prison: Correcting Gender Inequality in Prison Health, UNODC (2009). Tammy L. Anderson, Issues in the Availability of Health Care for Women Prisons, in The Incarcerated Woman: Rehabilitative Programming in Women’s Prisons 49-60 (S.F. Sharp & R. Muraskin eds. 2003). Margaret Moreland, Prisoners’ Rights Law Resources: Special Populations, Law Library Research Guides (last updated Mar. 4, 2015).